This dress was made to represent the people who came to Preston from Bangladesh – mostly from the Sylhet district. The national flower is the shapla waterlily or Nymphaea nouchali. I took the mid green colour for the dress from the flag. After I had made up the bodice and skirt (thankfully not the sleeves) I thought that there was not enough contrast between the front skirt panel with flowers and the side panels.It was a bit reckless re-colouring the side and back panels a darker green at at this stage, but luckily it worked. I also experimented with a red waistband and collar detail ( to represent the red part of the flag) but I decided against that addition, as it detracted from the waterlily detail. Sadly I think this is the last dress that I have time to make for the exhibition, though there were a couple more I had in mind, particularly to cover the much earlier migration to Preston from Ireland. 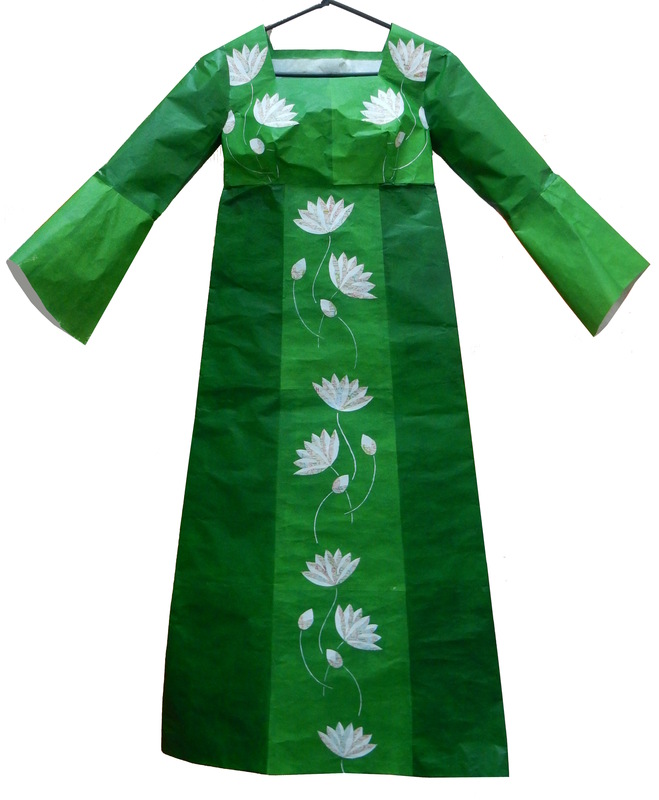 This entry was posted in Migration and tagged Bangladesh, paper dresses on January 13, 2016 by Catriona Stamp.